Since the attendance stats we published last year are still being viewed regularly, we felt the update we’d promised later in the season was probably about due. The good news for Leeds United is our average attendance has risen since October 2011, the bad news is that The Whites are still experiencing the highest drop in numbers in the division – this despite sitting only one point off the play-offs. 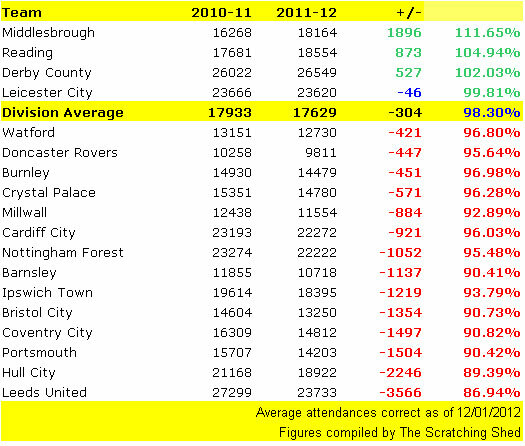 As the table above shows, Leeds have lost an average of 3,566 fans per game on last season. Let’s say each of those lost sales was worth a conservative £25 to the club, that would mean Leeds United are currently losing £89,150 every home game on 2010/11. In total, that would equate to over one million pound for the 12 home games we’ve played so far! The most worrying sign for Leeds is that the divisional average has risen quite substantially and is quickly coming into line with 2010/11 attendances. Back in October, sales were down 6.04% on the previous season. At the halfway stage, that’s already changed to just 1.70% which is a substantial increase in no way helped by the situation at Elland Road. More worrying still, is that Leeds’ average attendance is currently lower than it was in League One. In 2007-8, The Whites averaged 26,546. This dropped to 23,813 in 2009-10, which is only marginally higher than what we’re currently seeing, but higher nonetheless. We’ll pick this up again towards the end of the season.